Planet Aid Partners with Duke University Facilities Department - Planet Aid, Inc. 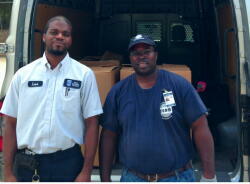 Through a clothing drive, Duke University's Facilities Management department donated 316 lbs of used work pants to Planet Aid. Thanks to Eric (pictured, right) and Levi (left) who worked with their department to make this happen, and for spreading the word to other University departments to recycle their textiles.